This is the final post for the yummy meal I made the other night. When I made the classic pesto it was specifically for this sammie. Now I am in love with homemade pesto and will never buy store bought again! Then I made the roasted tomato and pepper soup and realized I will never make canned cream of tomato soup again. With the fresh flavors and no cream, I just love a healthy version of my classic comfort foods! I had been trying to come up with a yummy new grilled cheese for the family. I was reading a pull out from my Everyday with Rachael Ray and they had 50…yes 50 different grilled cheese ideas in it!!! Many of which I knew my gang would never go for (I really wanted to do a brie with pear) so I decided to go with this one. Although it was a hard sell with Kevin (as I have said he doesn’t like meals with no meat) but in the end, between the soup and the sammie, he actually said he didn’t miss the meat!! I don’t have a panini maker so I used a cast iron griddle pan on the bottom and pressed the sandwich down with my regular cast iron skillet on top. You can even use a brick wrapped in tin foil for a press! If you have a panini press, turn it on to warm up; otherwise, set a cast iron skillet over medium heat. Assemble sandwich by smearing insides of bread slices with pesto. Arrange a layer of sliced tomato and season with a few turns of fresh pepper. 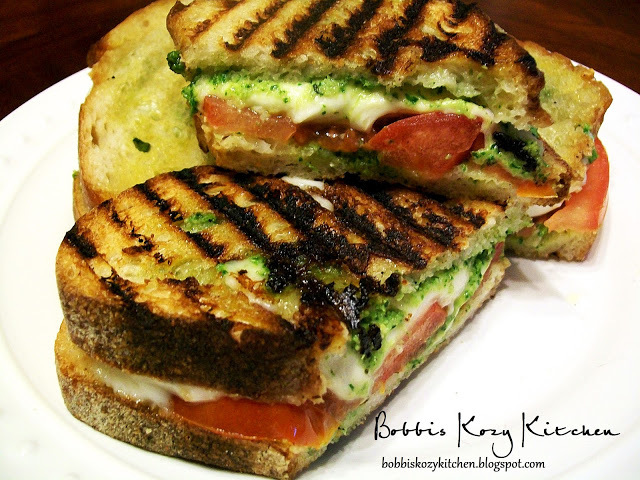 Layer the mozzarella slices over the top and then place another piece of bread on top to make the sandwich. Drizzle olive oil over skillet’s surface and place sandwiches on the hot skillet or panini press. If using a skillet, place another heavy skillet over the top to form a “press”. Turn after 2 to 3 minutes and replace weight. The sandwich is ready when golden brown and mozzarella has melted around the edges.